A Tim Hortons coffee cup. Is it mixed recycling? Does it belong in organics? Or does it belong with the other trash? 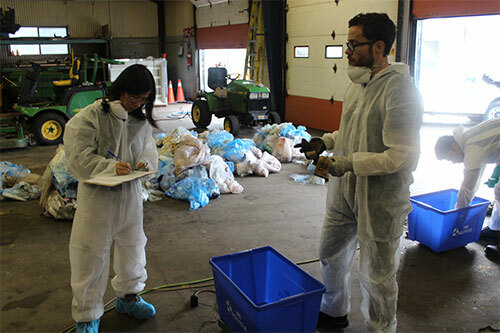 On Oct. 16, Sheridan’s Office for Sustainability conducted its first waste audit since April 2013. With the intention of finding ways Sheridan College can reduce the amount of waste it produces, the office and volunteers dug through waste collected around Trafalgar Campus. For the audit, the waste was taken from five high traffic areas around the school: the cafeteria, the Athletic Centre, A Wing, B Wing and J Wing. Educating students and staff around the college is a key outcome they hope will result from the audit. During the audit there were cases where the same items would end up in all three bins. “A big eyeopener is that there is a bit of confusion of which items go where,” said Mike McMillan, a co-op student at the Office for Sustainability. “With the coffee cups they end up in all the different bags. 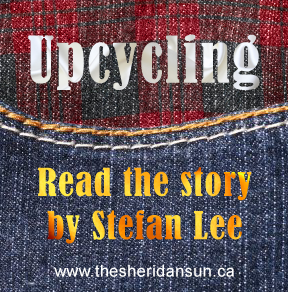 “It’s understandable, because a lot of the time when we see something made out of cardboard we intuitively put them in recycling, but Sheridan has a special arrangement to send them to organic,” he added. Although there is confusion about which bin coffee cups go into, some students still make the right choice. “When I am finished I put the lid into the recycling bin and the cup into the organics,” said first-year Visual Creative Arts student Tyler Vart. Created in 2010, the Office for Sustainability partners with students and faculty to try to meet Sheridan’s Mission Zero goals. The goals include reducing paper usage by 10 million sheets by the end of this year, decreasing waste that is sent to landfills by half this year and 75 per cent by 2015 and separating and processing 100 per cent of its organics by the end of this year (onsite by the end of 2016). Added by Michael on October 28, 2014.